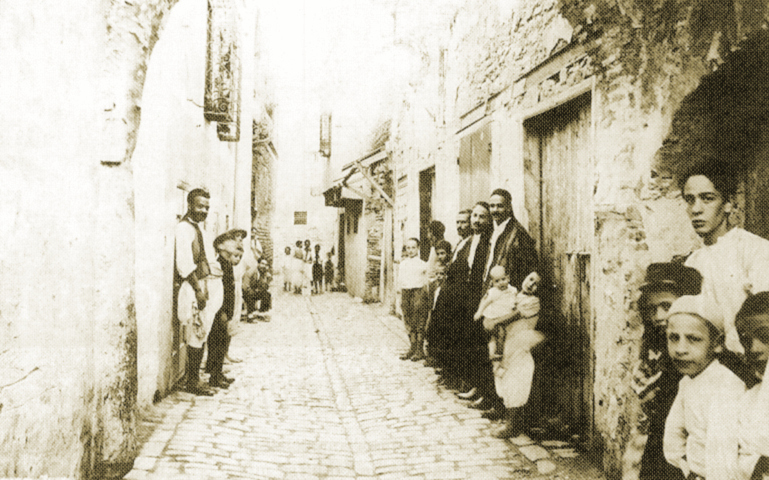 The Hara (Jewish quarter) of Tunis in 1886. There are perhaps 1,500 Jews in Tunisia in 2017. Within living memory, though, the country had a Jewish population of more than a hundred thousand. From the 13th to 20th century, in the capital city, Tunis, the Jewish quarter was a poor neighborhood called the Hara. It was home to an intense, often insular Jewish community that spoke Judeo-Arabic. This 1907 article suggests that the Hara celebrated every aspect of Purim in a big way: commemorating the story of Esther, widespread charity and hospitality, and, for some Jews, heavy drinking (of which the author clearly disapproves). The writer’s description of Purim foods may be slightly “off,” but the article gives a vivid account of celebrations in what was once a vibrant Jewish neighborhood in North Africa. (Archives Israélites, March 21, 1907. On the Saturday before Purim—known as Turnip Saturday or “Shabbat el Lefta,” which refers to a local legend—the young Jewish boys of the Hara are in the habit of celebrating Haman’s death. This mock ceremony is most unusual. Early that morning, the boys gather in a very old house that lies in ruins at the heart of the Hara, in a place called the kharba.